There are times when a road trip can do a club good. I'm thinking that a 9 game roadie to Minnesota, Miami and Washington might be what this team needs right now because home cooking hasn't helped them out much. Truth of the matter is that this ball club isn't very good right now. Their defense is atrocious as three more errors were committed today. Their clutch hitting nearly non-existent and there's a lack of fire amongst them. The bottom of the order is an automatic 3 outs, (unless Greinke is pitching) as there is a serious hole in the catching position at the moment. 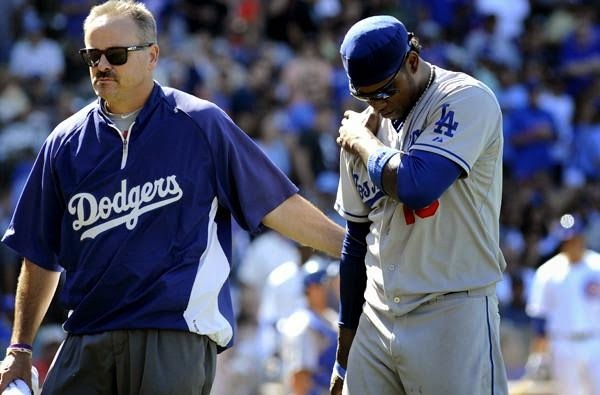 Now we are looking at Hanley Ramirez and the injury bug surfacing again. Maybe being on the road will help the Dodgers gel. It can't hurt, that's for sure, as a 4-6 record against lackluster opponents this stand didn't raise the confidence of anybody. Third place on April 27th isn't a disaster, but returning from this road trip buried in the standing could be cause for concern. But these are winnable games coming up against some mediocre teams. It's time for the Dodgers to wake up and kick things into gear. It was announced after the game that the team will be taking the cautious approach with Kershaw and that he'll make another minor league rehab start this Wednesday, probably at AA Chattanooga. A prudent move as we are still in April. That would mean that Kershaw should be starting one of the games in D.C., something that normally would have me jumping for joy as the Nats Park is about 20 minutes from me. Unfortunately, I'll be out of the country next week on a work assignment, so I'll miss the entire series, (wonderful timing...I know). Why is Drew Butera on this team? Miguel Olivo is hitting .390 at Albuquerque. 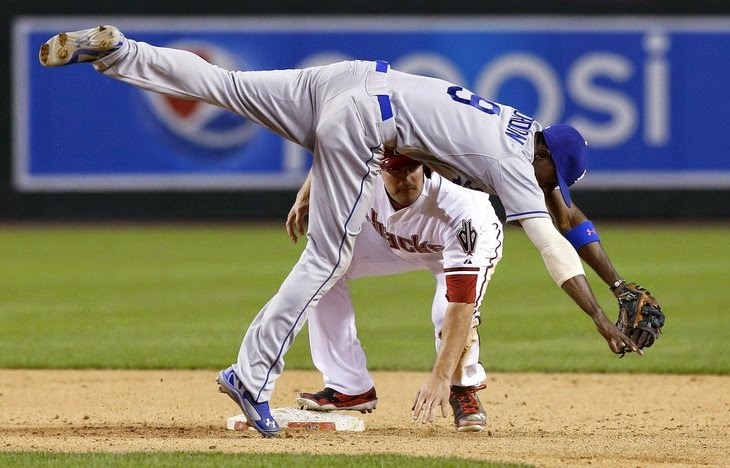 I know he's not the answer at the catching position, but I know this guy can outhit Butera with his eyes closed. They say Butera is a defensive specialist, but we've seen defensive shortcomings on that end of his game too. I'm sure Drew's a nice guy, but come on. The number 8 and 9 spots in the lineup are absolute outs. The way this ball club is hitting, they need something to shake things up. That's my late night rant. Nice to see a win tonight. The bully is struggling and Maholm's performance was much needed, but still three guys needed to go out there and close out this game that should have ended much easier than it did. Here's hoping Sunday's game closes out the home stand on a winning note. That dreaded essay that everyone grammar school kid must write on the topic "What I want to be when I grow up," is usually something we all remember. The answers vary. An Astronaut, a doctor, a fireman, or even President of the United States. Those are the common answers we see from kids. And for those of us that loved the grand old game, it wasn't uncommon to see "baseball player" amongst the answers of those kids that still hadn't seen their athletic dreams shattered by reality. As a sixth grader, I knew better. The love of baseball had already descended into my soul. I also knew that I didn't have the tools to amount to anything as a player. Heck, I couldn't even dominate on my Little League diamond, how would I ever excel and become a major leaguer? That left another option and that would be to be involved in the game, be it as a coach, another unlikely proposition as all of them were players at some point. Writing or speaking about the game would be an option to pursue though. I wrote about that, saying I wanted to be a baseball announcer or a sportswriter. That was my essay. I'd love to say I have it saved, but it has gone the way of so many of my childhood possessions, into the circular file and eventually deep into the bowels of the Puente Hills landfill. Vin Scully wouldn't be around forever my 11 year old mind thought at the time. Here I am though, 42 years later and he's still entrenched in the press box seat. I had the foresight to mention that I wouldn't mind writing about the game and interviewing players, coaches and baseball administrators. I wanted to have something to do with the game. I remember getting an "A" on the paper, and I was proud of that fact. But our teacher, Miss Page, had enough experience teaching that she went around the room and had us each discuss our topic and then she asked follow up questions. That is what I remember most about the project. She questioned us about the realistic expectations stressed "now" was the time to start preparing for that ultimate goal we had expressed. Within two years we'd all be in high school and it was time to stop messing around with our life's ambition and to go attempt to try and achieve it. When she got to me, she questioned the vocational goal. "There are 24 Major League teams and only 24 jobs announcing games. So you'll need a broadcast journalism degree and then you'll have to do some time working for almost nothing in the minor leagues. Those could be some difficult years," she said. "Sportswriting can be just as tough," as she stressed that being fresh out of college, I wouldn't land a job at the L.A. Times. "You'll have to write about local high school sports in small towns and work your way up," and then she added, " and the money won't really be that good." It all made sense what she was saying. She knew of my love for the Dodgers and she pointed out that I couldn't be a fan and impartiality would be important. Plus it might even ruin my love of the game because I'd meet people I looked up to and then see their faults and personality traits and that might turn me off from the game. "Evan, what if your first job in the major leagues was to announce for the San Francisco Giants? How would that sit with you? she asked. Well, that got me thinking. "I wouldn't like that at all," I answered. She continued: "Is there another job that you'd like to pursue as a career goal?" My next answer was completely improvised and off the cuff, but it was honest. "I'd like to learn other languages and travel the world. What that would be, I don't know." Life took it's twists and turns, and sports journalism had never been a part of it for me. My vocation choice was law enforcement, but in the international field, with Customs and Border enforcement. I learned two foreign languages and was blessed with the opportunity to travel abroad, through Latin America. The baseball journalism pursuit had long been abandoned. Internet message board postings were about all I engaged in on that front. But as the world wide web grew and expanded, I became more active in Dodger related boards, In fact, I soon realized that a large portion of my leisure time was involved in participating in those forums. What had been an interesting communication tool with like minded folks was soon becoming an outlet to write abut my passion for the Dodgers and interact with new found friends that thought alike. As fellow posters starting setting up blogs, I realized it was something I could do too. Opinion of Kingman's Performance was born, and with it came some accolades, and that felt good. Also came the struggles. Self imposed deadlines. Some criticism, some of it justifiable. Writer's block hit me hard at times. There was always the issue with time constraints. If only I could do this full-time, I knew I could raise the quality of the blog. But that just couldn't happen. I was entering the sunset of my career and a crucial time of it at that. Deeper vocational responsibilities and more time during my off-work hours working on work projects. That all reached a peak on April 1, 2014. Accepting my new work assignment in Washington, D.C., I hit the ground running with foreign travel assignments sending me to the Republics of Georgia, Argentina, Hungary and Egypt, all within the first two months. Though the Dodgers come to D.C. in early May, I won't be near the place at the time as I'll be bouncing around the Armenian/Turkish border about then. I can't help but think about those words to my 6th grade teacher so many years ago. "I'd like to learn other languages and travel the world." That seems to have come to fruition. But you can't have everything and somethings got to give. In this instance it is the blog. My baseball reporting dream is going to have to take a respite. Facts are facts and the truth is that I can't keep it up. I can't dedicate the time to make OKP that Dodger news source that so many have used over the past four years as daily Dodger reading material. I want to, but I'm too engaged in other pursuits. I'm not closing the blog down, but I'm cutting things back. Ron Cervenka at ThinkBlueLA.com told me that he doesn't "know how I did it for so long." Truth is, neither did I. The hours in the day aren't there. The distance from Dodger Stadium to me is now so far. Sure, I can watch the Dodgers from 12 time zones away on MLB.com, and a 7PM start time may be 7AM for me the next day, but it's not like I can sit down and dedicate myself to watching all the nuances of the game from afar. Lately my views of it are passing glances and checks on updated scores. Maybe things will change, but more than likely they won't for me. This isn't goodbye, but it kinda is. My posts will be few and far between. They'll be coming from the jungles of Central America and in the deserts of the Middle East if I can find the time. I'll be representing the Dodgers in a blue cap with the interlocking "LA" on it throughout the world, and if I run across other fans in my pursuits, I'll tell the story. How often that will happen I can't say. I will be able to say this though. There'll be a lot of score watching from this globetrotter, and it will definitely be an adventure. As difficult as it has been to watch the start of the season from three time zones away, that'll be nothing compared to the other locations I'll be logging in to watch from. Retirement is a few years away, and at that time my goal is to engage in OKP full-time, but by then, who knows where the blogging world will have advanced. In the meantime, I'll keep plugging away when I get the opportunity with an occasional post when I can. How often I can't say. I imagine there may be weeks that go by without a word and then there could be days in which I provide daily thoughts. It all depends on my work schedule and the time constraints caused by it. With the Dodgers completing another series victory against Arizona today, that's a 7-1 record against their division rivals, a team that many of us felt would be in contention this year. Let's be fair though. Arizona is smitten with the injury bug big time with the loss of their ace, Partrick Corbin, to Tommy John surgery. It was a moral punch to the gut they received as the season began and they haven't recovered. The result has been a major league worst 5-16 start that probably has put Kirk Gibson's job in jeopardy. Now, I'm not about to start feeling sorry for the D-Backs. They are after all, that cry baby organization that whined about us celebrating in their pool and they have an owner that is so paranoid about sending the right message out to the world that he banned Dodger fans from wearing blue right behind the home plate backdrop. The chronicles of the Diamondback story have been told here and other places many times. A 5-16 start isn't too much to overcome, but it sure doesn't help. Remember, the Dodgers are responsible for seven of those losses, so kudos to them. The rest of the league has beaten the D-Backs another four times. And those that say the Dodger record is tainted because they are 7-1 against the lowly Diamondbacks need to remember that good teams beat up on the cellar dwellers. Last place teams are usually there because of that. The Dodgers are not hitting on all cylinders and have played all but game one without their ace, and they are standing atop the division. Those are good signs that things will get better. Imagine where they'll be when they get hot. Last season the Dodgers struggled against the division. It wasn't the conventional way to win the NL West, but that's the way things were nonetheless. You're taking a dangerous route to a championship when you underperform and go 37-39 against your direct competition and the teams you are competing against in nearly 50% of your contests. But the unconventional was the norm in 2013, and the Giants, who had the best record against the rest of the NL West at 44-26, only played .344 ball (32-60) against everybody else, ended up 16 games out of the hunt. Don't expect that to repeat this year, but I would not expect the Dodgers to falter at a below .500 clip against the division either. It'll be a tight race between the Northern and Southern California rivals, as it should be. "We know we're going to have to play good baseball as our division has gotten better," chimed Don Mattingly before the season began to MLB Network's Dan Plesac. His statement appears to be true on most fronts, though the D-Backs have got off to a rough start, as expected the Giants are going to be formidable. The Dodgers will have their hands full with them before next weekend is out after a 3 game set at AT&T Park. Look for the Dodgers to raise up and take two of three there. A 7-4 start out of the blocks isn't something anyone should be disappointed with, especially with he likes of Kershaw, Wilson and AJ Ellis sidelined. With 151 games to go, Los Angeles knows how to overcome injuries, as they did so in 2013 on numerous occasions. Fact is, it is the norm for this ball club to be snakebite with injuries on a continuous basis. It's something that we are simply getting used to, and good ball clubs are able to overcome injuries. The four man outfield is working out as planned, with always someone suffering a twinge or a sprain here and there. If Matt Kemp can stay quiet about it and not ruffle any feathers, there should be sufficient playing time for all four guys in the tandem, and even some more for Scott Van Slyke too. The pitching staff is missing their most key component amongst starters and their set up man in the bullpen, but that was the situation last season too with Greinke out for a couple of months and Brandon League faltering. Add to that the injuries to Beckett and Bilingsley shortly thereafter. If all goes according to plan, I see the staff being stronger for the Dodgers at this point of the season than they were last year, mainly because Billingsley will be back for the second half and Kershaw won't be out there toiling for too many innings as he has since 2010. If the Dodgers are able to keep themselves out of any major ruts, such as last season's last place performance between April and early June, they'll be right just where they are expected at the September stretch run. Watch for this team to break away around then, as the mesh of injured players currently will be hitting their stride at the most important point of the season, and not fading due to fatigue. Those injuries might be a blessing in disguise. After spending my first week living on the east coast, I must say that I have an incredible amount of respect for those Dodger fans that stay up night after night to start watching the Dodgers play at 10:00 pm EST. I'm having a difficult time adjusting to this and don't know if I can keep it up. Kudos to those great fans on this side of the country who are able to continue with their allegiances from afar. A Look at Dodger Injures. Is It Bad Luck or Too Many Risky Contracts? As the Dodgers entered the 2014 season, prognosticators in baseball circles overwhelmingly predicted them to take the division. With the core of players they have and the record setting payroll, it made sense. They were returning from a successful 2013 run that left them a few games shy of the World Series. Los Angeles was seen as the dominant team in the NL West "IF" they stayed injury free. That "IF" we are finding for the second consecutive year to be a gigantic "IF." Kershaw, Wilson, Crawford, Greinke, and Haren have all been sidelined for substantial periods since March 1. Then add to that Matt Kemp, Josh Beckett and Chad Billingsley being out for substantial periods due to off season rehab programs following surgery. The Los Angeles Dodgers have a repeat of the MASH unit that they were last season and it's only one week into the season. They overcame those problems last year, for the most part, but one can't help wondering what would have happened had Matt Kemp and Chad Billingsley been available for the playoffs. (We all know that Hanley Ramirez's broken ribs doomed them in the NLCS). We are also being unrealistic to expect a winning string of 42 out of 50 games during any stretch this season. The Dodgers simply can't bury themselves early as they did last year. So is this injury rut simply a run of extremely bad luck? Are the Dodgers signing players with risky medical histories? Is it that the Dodgers are doing something wrong in the medical arena? I don't have the answers and a lot of us can't pinpoint the exact problems, but its fairly safe to say that there is a lot of speculation going on. When you work out a trade that includes a player going under the knife with Tommy John surgery the night before, I'd say that's a risky proposition. That's what Ned Colletti did when he made that late August, 2012 trade with Boston where Josh Beckett, Carl Crawford, Adrian Gonzalez and Nick Punto joined the club. Crawford had struggled for two years, gained weight, and had a bum throwing arm. It wasn't realistic to see him return to his former glory being on the wrong side of age 30. Add to that his enormous contract that pays him through the 2017 season at over $20 million a clip, when he'll be 35 years old. That was a bad deal, no doubt about it, and in the end it log jams the guys advancing in the minors, like Joc Pederson. 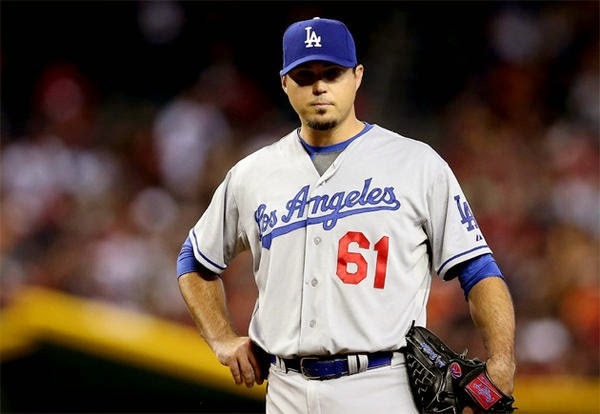 Josh Beckett arrived at age 32, already with a deteriorating fastball and suspect stuff. Now we read that he hadn't been physically right for years, with a loss of feeling in his hands that culminated into his season ending surgery last season to remove a rib (thoracic outlet syndrome procedure) and get him back the ability to throw without pain or numbness. Now at age 34, he's suffering other maladies like ankle sprains and doors closing on his thumb. It's bad luck, it's age related stuff and that combination is never good. Chad Billingsley and Clayton Kershaw have thrown a lot of innings in their young careers, and it makes you wonder how long young guns can throw before eventually having to go under the knife. In Bills case, that was answered in 2012 at age 27. For Kershaw, you've got to wonder, as he has led the league in innings pitched over the past three seasons. Clayton hasn't suffered arm injuries as far as we know, but are they looking at a high risk proposition with him, especially since he signed that record setting deal this off season? You bet they are. Watch Kershaw closely this season. Mechanics are a key to his longevity and a serious back ailment can mess with them. This is a player that is key to the Dodgers long term success. A guy that comes around once every thirty/forty years. They have to keep him healthy. If that means sitting him until he's 100%, then so be it. There is too much money and franchise future dependent on that left arm of his. The days of players like Steve Garvey and the great Cal Ripken are gone. In fact, as the years go by, my admiration for what Ripken accomplished (and the Garv too) grows exponentially. There will never be a player that comes near that consecutive game streak record and it's about as untouchable as any in baseball. The game has changed so much and freak things happen all the time that keep players out of lineups. Teams invest too much money in players now to run them out there everyday. There's no doubt in my mind that Matt Kemp's pride at playing every game for over 3 consecutive years played a role in his injury issues. Now they can't get him healthy enough to play half the season. 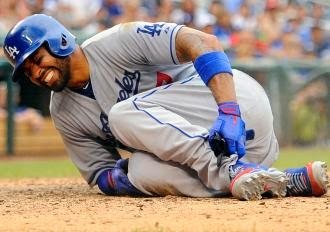 Kemp needs to drop the attitude and accept the fact that he needs days off and in the end it'll make him a better player. Clayton Kershaw has pitched over 230 innings for three consecutive years. Those are tough innings too because he's come within two strikeouts of leading the league in Ks for three straight years as well. Are we living on borrowed time here? He went on short days rest in the playoffs last year too. All this is recipe for disaster and can catch up with him unless he has some sort of bionic arm. Don't forget that Orel Heshiser went down with a serious shoulder ailment requiring sugary just one short season after the 1988 heroics. I know nothing about whether the Dodger medical staff is doing things right. They have the advanced degrees. They have the strength and conditioning coaches that work as hard as anybody I've ever seen. They put in their time and their dedication is unparalleled. They also have the best medical facilities in the game, at Spring training and at Dodger Stadium. I have a hard time believing that the Dodgers are doing anything wrong here, but some are quick to criticize this group because of the numerous injuries that have surfaced over the years. Bad luck has played a role though, and you can't control that. Take Hanley Ramirez for example. You can't blame the Dodger med staff for his WBC thumb injury last year. You also can't blame them for Hanley running into a brick wall at Wrigley and the Cardinals beaning him in the ribs in the NLCS. Those occurrences were unlucky and it's as simple as that. Now, his hamstring issues? Could that have been prevented? Maybe so. Perhaps the the med staff acquiescing to impatient players desires to return to the field too soon. The bottom line is that baseball's 162 game season allows for numerous injuries and no team can avoid the aches and pains that occur throughout the full year. The key is to minimize them as much as possible and have as many components ready to play when the post season arrives. The Dodgers got to post season play last year, but they were hardly a healthy team when they arrived. Had they been so, I have little doubt that they would have played in the fall classic. Good teams overcome injuries, but more often than not, injuries can overcome good teams. A combination of good luck combined with a crackerjack medical staff can play huge dividends. The risky long term deals? Well that is on the general manager, and it remains to be seen if the Dodgers have taken on too many of those contracts. There are probably those of you out there that are wondering why the activity on this blog went. The season starts and the the posts on OKP vanished. There's a ton of Dodger news out there and OKP is producing nothing. Patheric, I know. Opening Day and I've got nothing. A few weeks back I explained that I would soon be relocating to the east coast. Well, this week turned out to be what I call the "ultimate road trip experience." My job transfer occurred at the worst possible time for a baseball aficionado. Opening week for me has been a 2,850 mile trek from west to east in some of the most treacherous driving conditions that I ever experienced. 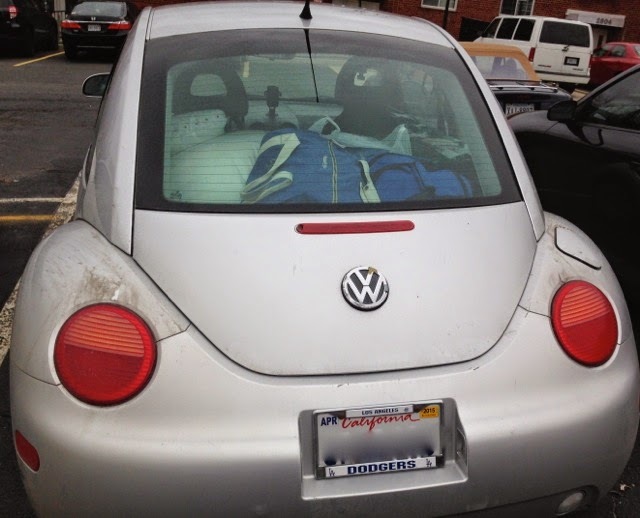 On Tuesday, April 1st I finished packing up my stuff and loading it into my VW bug and I drove across the country from California to Washington, D.C. This sounds like something you'd do in your early twenties, but I did it at age 52 and at a crossroads in my career. It is truly an adventure and as I enter my new workplace this coming Monday, is is with some trepidation and concern, but in the end...it'll be a growth experience as I enter the last five years of my career. It was no April Fools day joke that I took off this day, but then again, maybe I should have seen it as an omen for what was to come. The Dodgers were pretty far from my mind and though I was able to listen to two of the three games from San Diego as I meandered my way through California, Nevada, Utah, Wyoming, Nebraska and Iowa, it was the weather that was truly my major concern. 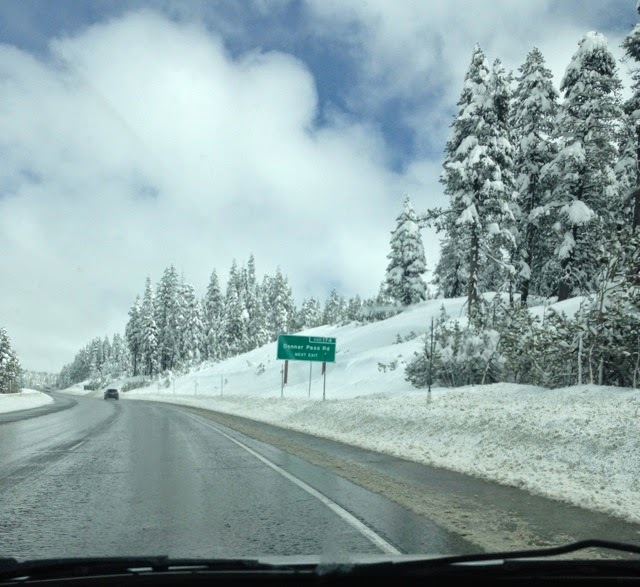 Stopped on the Donner pass west of Truckee,CA and forced to put chains on my car, I trudged through the California Sierras on my way east. It took 6 hours to get through a region than normally takes only 1.5, and the trip was off to a lackluster start. The goal was to reach Green River, Wyoming on the first day, about 1/3 of the way to my ultimate destination. By the time I reached Winnemucca, Nevada, I was fairly sure that was an unrealistic expectation. What followed was one of the most nerve-racking drives of my life. 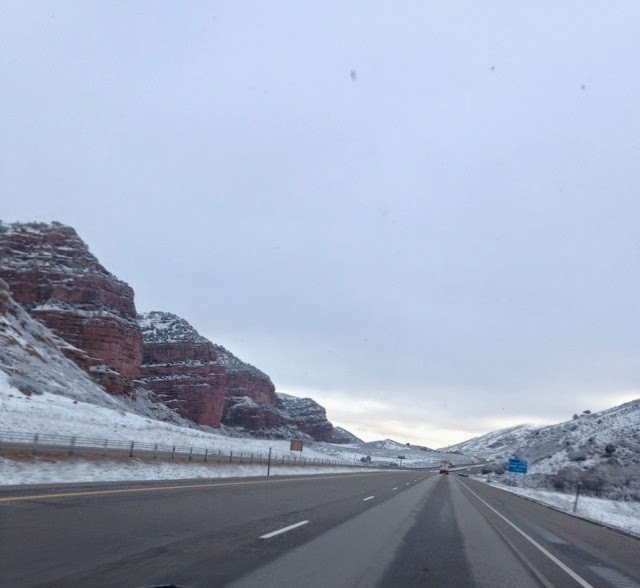 Wind blown snow driving straight into my windshield as I headed east towards Utah. I could barely see the broken center line on that very dark night, which worked fine until the occasional speeding 18 wheeler would blast by me at speeds in excess of 80 mph. What a relief it was to see the snowfall dissipate by the time I arrived at Wendover. NV., and all the while this was happening, MLB.com on my i-phone transmitted the Dodger's Tuesday night win in San Diego. I even got sporadic images of live action through MLB TV on the phone, which was quite a treat. The blizzard I drove through was straight ahead. 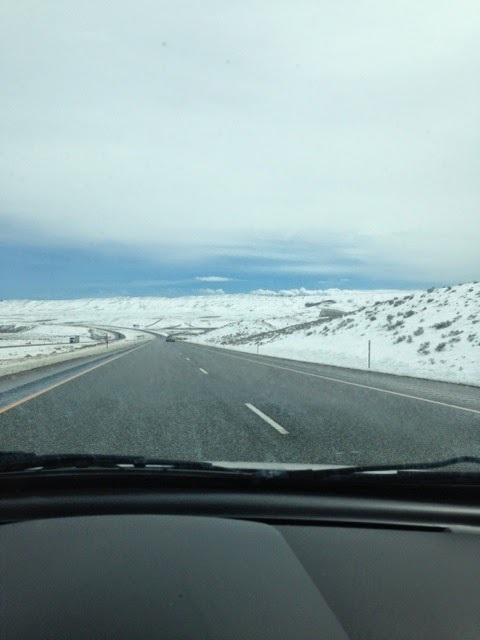 Heading east on I-80 through eastern Nevada. I settled in Park City, UT at about 12:30 am. About 180 miles short of my intended destination, but I figured that with about 5 hours sleep, I could get up early and make up for the time I lost. What I didn't count on was the tumultuous weather ahead. 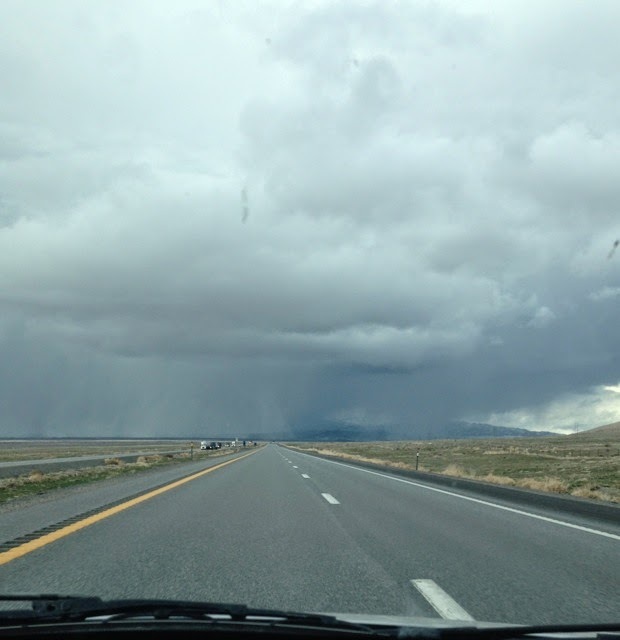 With the Dodgers record standing at 3-1, I departed Park City at 7:00 am being fully aware that I was in for a Wyoming winter storm on I-80 in the first stages of spring. With chains in the trunk, I was simply hoping I could weather through this trek without having to complete the tedious tasks of re-installing those things in freezing weather. The VW was running like a champ and when I passed through Green River, WY (more original first day destination) at about 9:30 am, my satellite imagery on the I-phone assured me that things would be a bit dicey ahead. But I made it. There was strong winds, sleet, snow, some black ice and truck after speeding truck making their way through the region, but my tough little beetle pulled past Laramie and Cheyenne without incident. 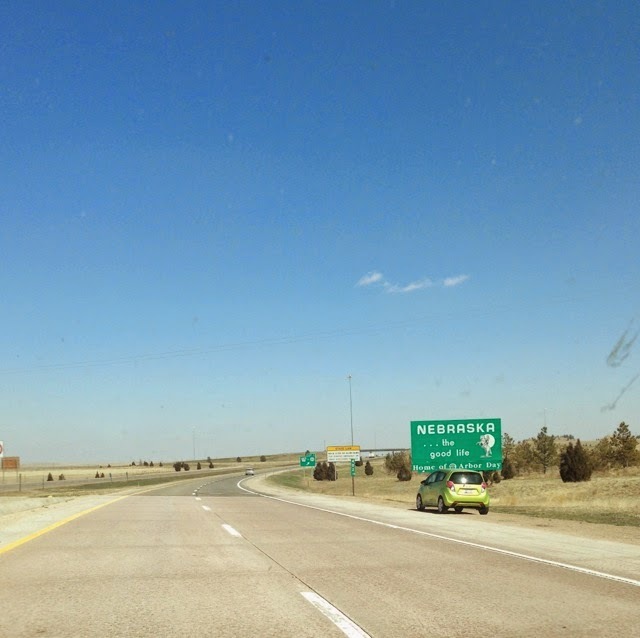 Arriving at the Nebraska state line there was a relieving blue sky ahead. My goal was to make it on through Nebraska into Des Moines, IA after a 14 hour drive. Well, I didn't make it in 14, but 15 did the trick. What may have been the toughest part of the trip was finding my booked hotel that wasn't along the interstate and caused a rather tired and frustrated traveler to drive around in circles for 30 minutes before finding it and turning in again past midnight CST. The Dodgers won the final in San Diego the night before and though I had driven through clear skies in Nebraska, the coverage was a bit spotty over the satellite. I'd switch between Charley Steiner and Jaime Jarrin when buffering for a connection would occur in order to get the transmission. But L.A. moved to a 4-1 record by the night's end. Kept a log sheet to keep me occupied. 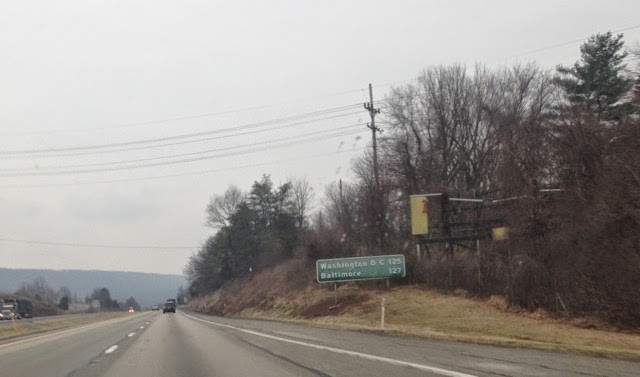 I started out this Thursday morning (April 3rd) early again at 7:30, aiming for the Pennsylvania/Ohio border by nightfall. 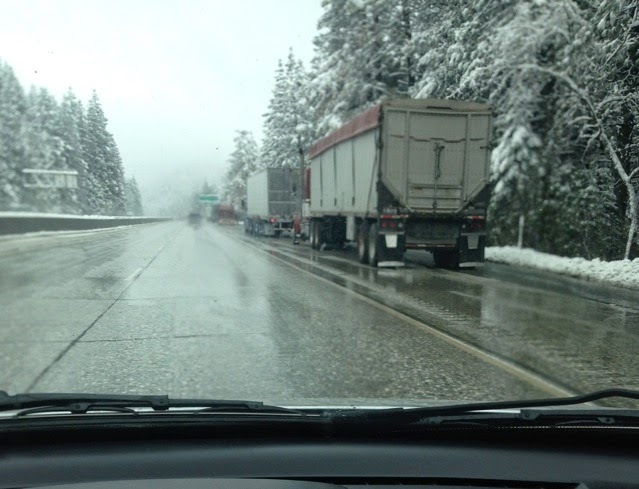 I learned something about the U.S. interstate system on this day. I have a new appreciation for California freeways. They are called "freeways" because they are FREE. By free I mean, it doesn't cost a dime to drive on them, which is the last thing I can say for Illinois, Indiana, Ohio and Pennsylvania. Between the four states, about $80 was shelled out in tolls. You'd think that with those tolls collected, they'd be able to maintain immaculately smooth roadways. Well, not quite...right Indiana? Though this was my shortest driving day, (only 13 hours), the incessant rain and thundershowers made it another treacherous trip. Combine that with the traffic from suburban regions of Chicago, Cleveland and Pittsburgh and I was a nervous wreck by the time I rolled into my final hotel in Monroeville, PA at 10:00 pm. I was now just four hours from my new home. Oh, and the apartment I had arranged to rent the week before was rented out from under me that day as the landlord sent me a text advising that she couldn't wait any longer and had found a tenant that signed a lease that day. As I turned in the night before, weather forecasts announced a possible winter storm warning by 8:00 am. What I thought would be the first day I'd sleep in was far from it. I was going to beat that storm out of town and try to arrive at DC before snow stopped me in my tracks. After all, I needed to find a place to live now, and quickly. A 6:00 am departure was in the works and my 4 hour drive to the nation's capital was rather uneventful. I set up two apartments to look at. Then there was a room to rent in another area in Northern Virginia. My wife remained behind in California as she hasn't been able to swing a job transfer yet, so it was decided that I'd find a small space to rent at minimal cost. Apartment one was essentially a borderline slum. A basement apartment in a relatively seedy area. Apartment two, a little better, but too costly. My third option was a room to rent and the landlord called. It was a good fit. It was 4:30 pm and I was signing documents when my I-phone chimed. An MLB update: First inning, Giants 6, Dodgers 0. Ugh! Maybe it's best not to follow the team today. This is one day I'm happy to not b in San Francisco. It's time to move in. Maybe after settling down next eek, I'll be able to get back to baseball. For the time being though, the link list to the right might be the way to go. I barely had time to even look at that. 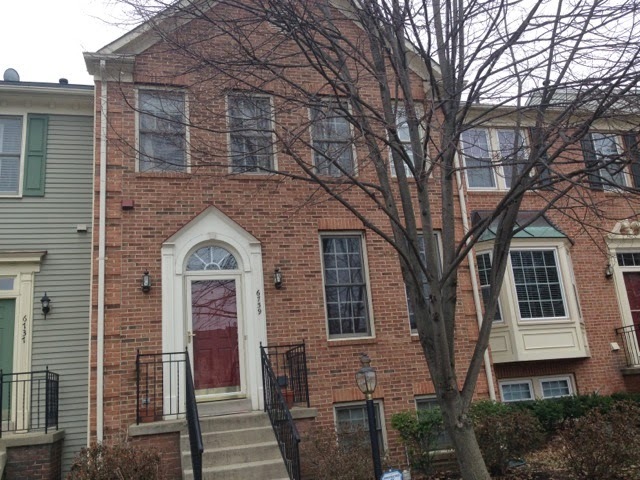 Found a room to rent in this Alexandria, VA townhouse. OKP's east coast adventure begins. So anyway, that's my week and excuse for the lack of Dodger related posts. I'm hoping to start things up again this coming week, but things are a bit unpredictable with all the life changes in play. The next adventure will be watching Dodger baseball from the Eastern Time zone. The challenges never cease.